Dallas, TX (April 22, 2017) – Dallas Summer Musicals, Inc. (DSM) announces the appointment of Kenneth T. Novice as its President. Novice will begin his position on May 1, 2017 with an immediate plan of action to continue the work that David Hyslop, DSM’s Interim Managing Director, started last year of instilling stability and sustainability for the organization. Novice is a seasoned theater management executive with over three decades of leadership experience. He previously served as Managing Director of Los Angeles’ Geffen Playhouse and Pasadena Playhouse in Pasadena, CA. Novice’s career includes organizations with rich cultural histories similar to Dallas Summer Musicals, including San Diego’s The Old Globe and Circle Repertory Theatre in New York. Novice also served as Head of Theatre Management, designing curriculum and teaching courses for the California State University Long Beach Theatre Management MFA/MBA program. Novice led the Geffen Playhouse from 2009 to 2015, developing and executing the organization’s strategic plan and producing such notable productions as the West Coast premiere of John Logan’s I’LL EAT YOU LAST starring Bette Midler, the world premiere of Beth Henley’s THE JACKSONIAN starring Ed Harris which transferred to New York, the West Coast premiere and Kennedy Center productions of THURGOOD starring Laurence Fishburne among many others. Novice’s credits at Pasadena Playhouse include the world premiere of the Tony Award-nominated musical SISTER ACT THE MUSICAL and the acclaimed production of August Wilson’s FENCES starring Laurence Fishburne and Angela Basset among many others. Novice’s career is marked by a dedication to education and outreach, developing community partnerships, building brands and communication programs and increasing board engagement. 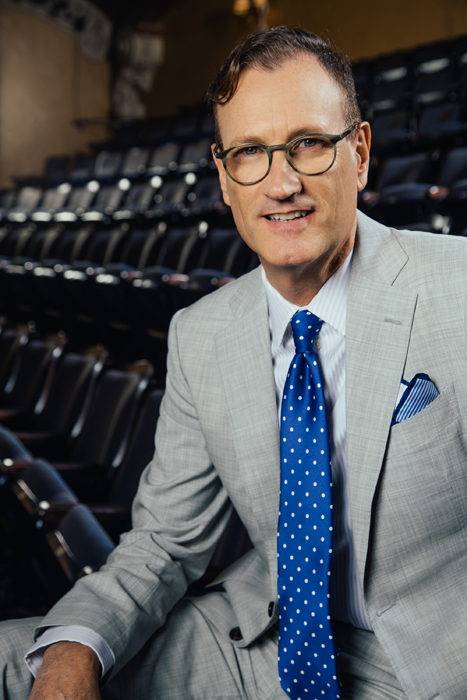 David Hyslop, a respected arts veteran, has served as DSM’s Interim Managing Director since May of 2016 while the Board of Directors launched a search for a permanent President. Immediately recognizing the potential of DSM, Hyslop begin establishing collaborative partnerships and building on the opportunities to revitalize the organization. Hyslop will stay on in an advisory capacity to ensure a smooth transition as Novice begins his new position. “We are extremely grateful for all that David has done for DSM over the last year. His extensive experience and contacts in the arts community in Dallas and across the country have been invaluable to DSM. David provided significant leadership, as well as a calm voice of reason, to DSM and our Board, and helped provide stability and leadership to the organization throughout this transition,” commented Munselle on Hyslop’s time at DSM. DSM’s Search Committee was headed by Executive Board Member Scott Collier. The committee interviewed many candidates but felt that Novice had the right skills to keep the beloved tradition of DSM, expand the outreach programs and funding and help obtain financial security for the organization. “The search committee spoke with various members of management, Board members and colleagues from Ken’s former positions at the Geffen, The Broad Stage, Pasadena Playhouse and The Old Globe and without exception, Ken was enthusiastically recommended for this position,” said Collier. Novice will also steer DSM into the new era that the organization promised the community as part of the new partnership with Broadway Across America, to bring the best and brightest shows from Broadway and beyond to the Metroplex. Dallas Summer Musicals’ 2016-2017 season continues with CIRCUS 1903 – THE GOLDEN AGE OF CIRCUS, May 23 – June 4, 2017 and closes the season with THE BODYGUARD, July 18-30, 2017. Single tickets are available at DallasSummerMusicals.org, by phone at 1-800-745-3000 or in person at the Music Hall at Fair Park box office Monday-Friday from 10 a.m. to 6 p.m. and Saturday from 10 a.m. to 4 p.m.
Dallas Summer Musicals’ highly anticipated 2017-2018 Broadway season will kick off with the season add-on IRVING BERLIN’S WHITE CHRISTMAS, Dec. 5-10, 2017; followed by THE COLOR PURPLE, Jan. 23 – Feb. 4, 2018; ON YOUR FEET!, Feb. 27 – Mar. 11, 2018; WAITRESS, Mar. 28 – Apr. 8, 2018; LES MISÉRABLES, Apr. 24 – May 6, 2018; DISNEY’S THE LION KING, Jun. 13 – Jul. 8, 2018; LOVE NEVER DIES, Jul. 24 – Aug. 5, 2018; and closing the season will be SCHOOL OF ROCK, Aug. 15-26, 2018. Dallas Summer Musicals’ 2017/18 season tickets are on sale online at DallasSummerMusicals.org, by phone at 1-866-276-4884 Monday – Friday from 9 a.m. to 5 p.m. CST. Season tickets can also be purchased in person at the Music Hall at Fair Park box office Monday-Friday from 10 a.m. to 6 p.m. and Saturday from 10 a.m. to 4 p.m. Payment plan options are available. In addition, season ticket buyers have the option to include the season add-on to their season subscription, which is discounted for subscribers. For groups of 10 or more call 214-426-4768 or email Groups@DallasSummerMusicals.org. HAMILTON and ALADDIN will be coming to Dallas Summer Musicals in its 2018-2019 Broadway season! Subscribers from the 2017-2018 Broadway season will have first access to HAMILTON and ALADDIN when renewing for the 2018-2019 Broadway season. Performance dates and times will be announced at a later time. Since 1941, the non-profit Dallas Summer Musicals Inc. (DSM) has presented the very best in Broadway to North Texas audiences. Located in the historic Music Hall at Fair Park, DSM promotes excellence in live musical theatre with year-round performances for diverse audiences of all ages, impacting the lives of children and families through education and community outreach programs, while enriching the cultural landscape of North Texas and the Southwest Region. As a 501(c)(3) non-profit organization, DSM relies on a variety of funding sources to offer affordable ticket prices, preserve the beautiful historic theatre, educate young audiences and develop impactful community programs. DSM gratefully acknowledges the support of our season sponsors, annual fund donors and corporate partners American Airlines, Texas Instruments, The Dallas Morning News, and WFAA TV Channel 8. For more information about Dallas Summer Musicals, please call 214.421.5678 or visit our website at DallasSummerMusicals.org.